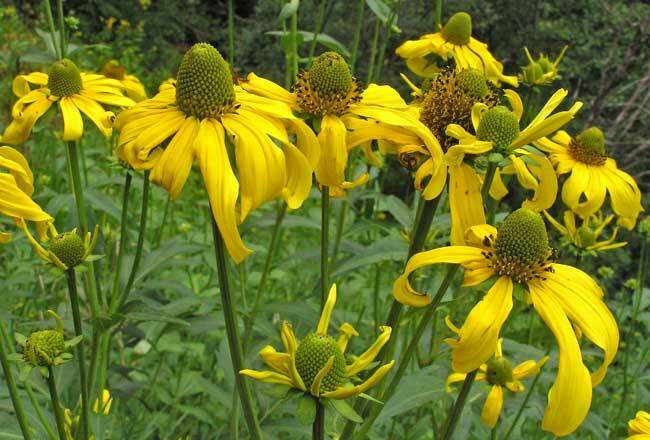 Most floras and botanical authorities indicate that Linnaeus named the genus "Rudbeckia" to honor both the father and son Rudbecks, world famous professors at Sweden's Uppsala University, the University Linnaeus attended. 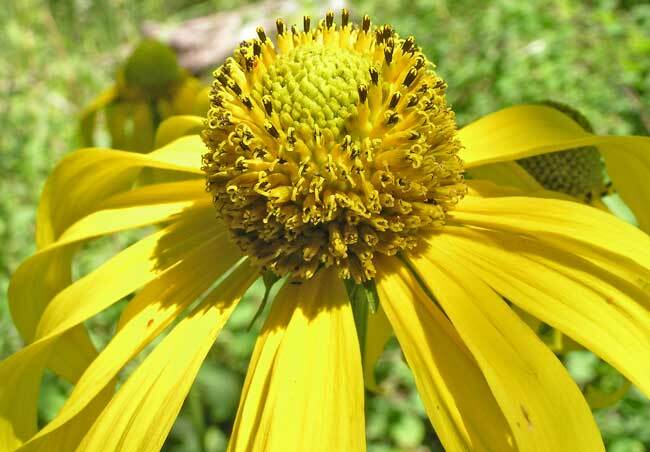 In several 1737 publications Linnaeus does indicate that the Rudbeckia genus name honors both father and son, but there is no question that Linnaeus' original intent was to honor Rudbeck the younger, his professor, mentor, employer, and patron, for he states that in a 1731 letter to Rudbeck the younger and it is that letter which I believe takes precedence over any later attribution. We know that in the spring of 1730, Olas Rudbeck the younger appointed Linnaeus (even though he was just a second year Uppsala University medical student), to replace himself as lecturer in botany and to lead the prestigious spring Botanic Garden demonstrations. After the course was over, Rudbeck hired Linnaeus to tutor his three youngest sons and in June of 1730, Rudbeck invited Linnaeus to live in his house and eat at his table. Rudbeck went even further in the interest of this young man he considered so brilliant by obtaining a "special grant from the Senate" for Linnaeus. Rudbeck had thus rescued Linnaeus from a student life of utter poverty, for until Linnaeus received Rudbeck's largess, he had been walking in shoes patched with paper in their soles and he was barely finding enough food to fuel his brain and its quest for understanding nature. So long as the earth shall survive and as each spring shall see it covered with flowers, the Rudbeckia will preserve your glorious name. Rudbeck the younger was 71 when Linnaeus wrote the July 1731 letter to him. Rudbeck the elder had died in 1702, five years before Linnaeus was born. Both Rudbecks were eminent botanists with world-wide reputations and certainly both would have been idolized by Linnaeus many years before he even went to Uppsala University. "I have named plants of this genus [Rudbeckia] for the most noble Rudbecks, their knowledge of genera renowned throughout the world". 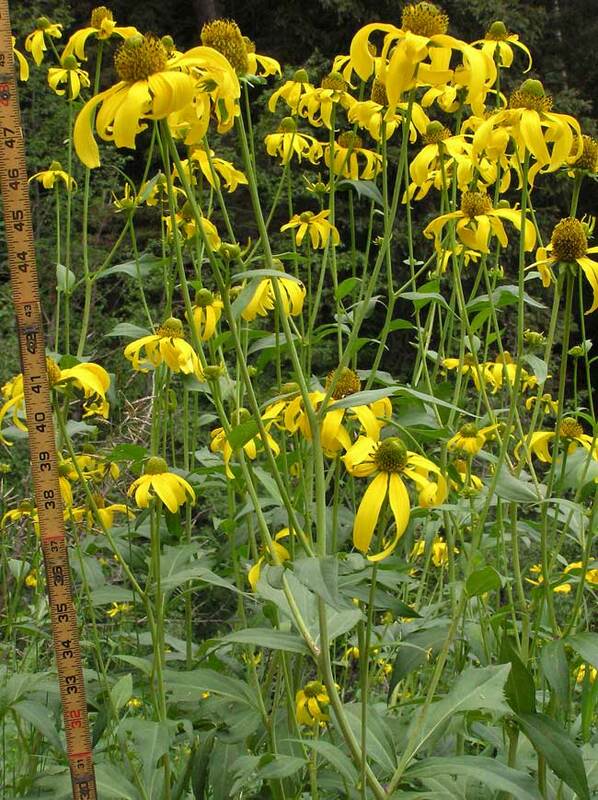 Why would Linnaeus have changed his dedication of the Rudbeckia genus? My assumption is that he matured in the six years between 1731 and 1737. As a young student full of enthusiasm for his professor (Rudbeck the younger), Linnaeus was eager to honor him. Six years and much maturing and experience later, Linnaeus realized that courtesy and custom would make it imperative that he name the plant not just for one of the two great botanists and professors but for both. However, it is clear that the genus was named in 1731 for Olas Rudbeck the younger. Nothing can change that. 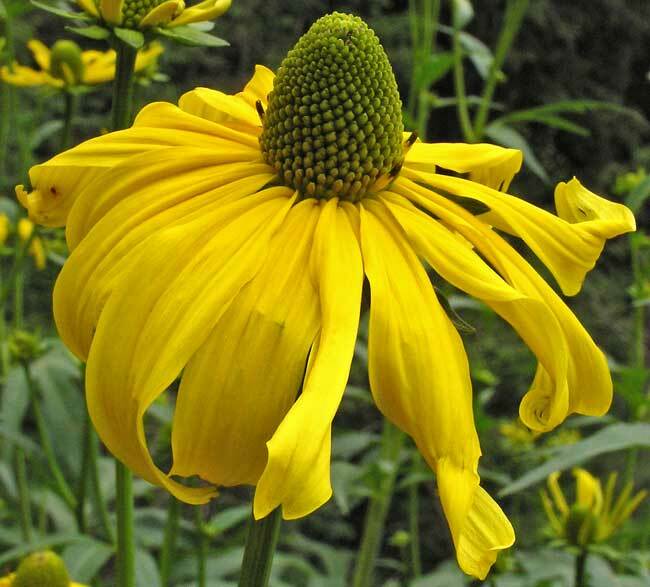 Another mystery regarding Rudbeckia has given me many interesting research hours: How did the 24 year old Linnaeus acquire the plant specimen that he named "Rudbeckia"? 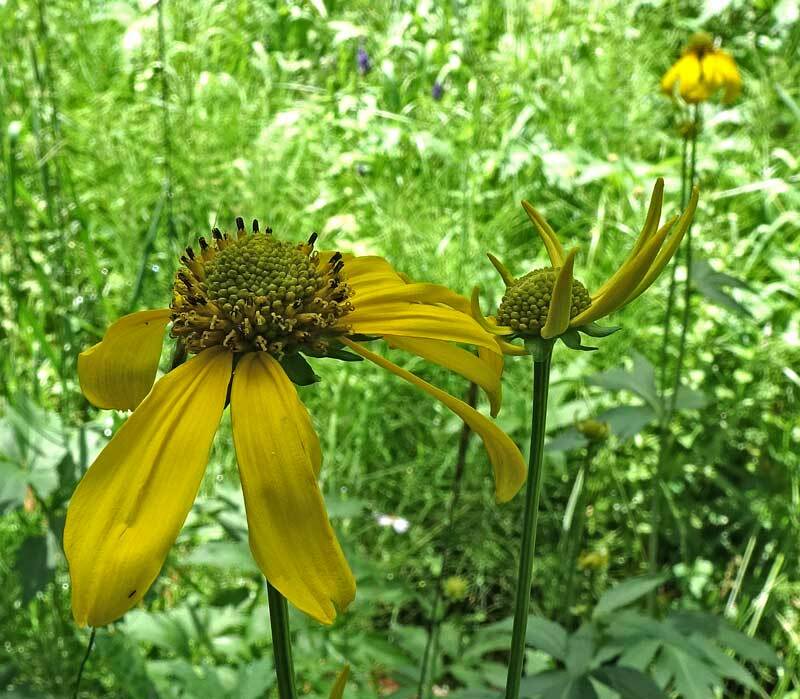 I at first thought it a good possibility that Rudbeckia came to Linnaeus from America through the eminent botanist, John Bartram (1699-1777), often called the Father of American Botany. Linnaeus came to know Bartram through the British botanist Peter Collinson, to whom Bartram sent many North American plants, some of which Collinson sent to Linnaeus. Linnaeus did consider Bartram the "greatest natural botanist in the world". However, John Bartram was, until the early 1730s completely immersed in the running of his farm in Pennsylvania and the upbringing of his 11 children. He was too busy for plant collecting until after 1731. In addition, Bartram was not introduced (through correspondence) to Collinson until 1733, two years after Linnaeus named Rudbeckia. I thought that another possible source for the Rudbeckia type specimen was John Clayton who supplied Linnaeus' friend Jan Gronovius with many North American botanical specimens. However, Linnaeus did not meet Gronovius until 1735, and it appears that Clayton did not begin his serious plant collecting until the early 1730s, after Linnaeus had named Rudbeckia. Mark Catesby was another great early American botanist, and his collecting dates, plant distributions, and connections made me think that he would be the most likely source for the Rudbeckia specimens that Linnaeus described and named. Catesby botanized in the colonies and the Bahamas from 1712 to 1719 and 1722 to 1726. We know that Catesby was shipping plants and seeds to Peter Collinson at least by 1724: "On 5 January 1723/24, from Alexander Skene’s house on the Ashley River near present-day Summerville in South Carolina, Catesby sent Collinson a selection of seeds that... had been collected with difficulty." (Catesby Commemorative Trust, "Resources"). We know that Collinson commonly sent plants to Linnaeus. 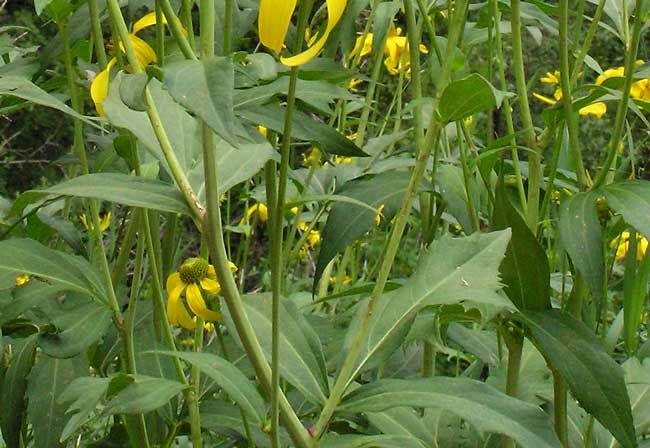 Who discovered Rudbeckia hirta [apparently the first Rudbeckia described]? Who knows, it was likely one of the earliest plants sent back to England to be cultivated in English Gardens and while it may well have been Catesby that brought it back I have found no records to indicate that. Having eliminated Bartram, Clayton, and perhaps Catesby (I will not be surprised at all to find out that somehow Catesby's collections of Rudbeckia wound up with Linnaeus), we are left with just one sure piece of information: Linnaeus named and described Rudbeckia. And we still have two unanswered questions: where did Linnaeus get the specimen and who brought it to that location? Click to read more about Mark Catesby and click again for more Catesby information. Click for more biographical information about Olof Rudbeck the Younger and his father. "Laciniata" is Latin for "torn or rent", which here refers to the cut leaves. 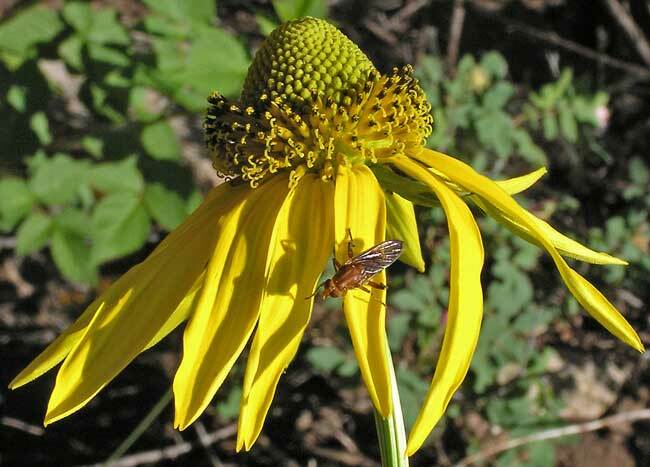 In 1901 Aven Nelson renamed this species Rudbeckia ampla, and in 1955 the species was renamed Rudbeckia laciniata variety ampla by the eminent botanist Arthur Cronquist (of Intermountain Flora). "Ampla", Latin for "spacious", refers to the large flower. Montane, subalpine. Streamsides. Summer, fall. Above: Rough Canyon Trail, July 18, 2018. Left: Roaring Fork Road, August 7, 2004. 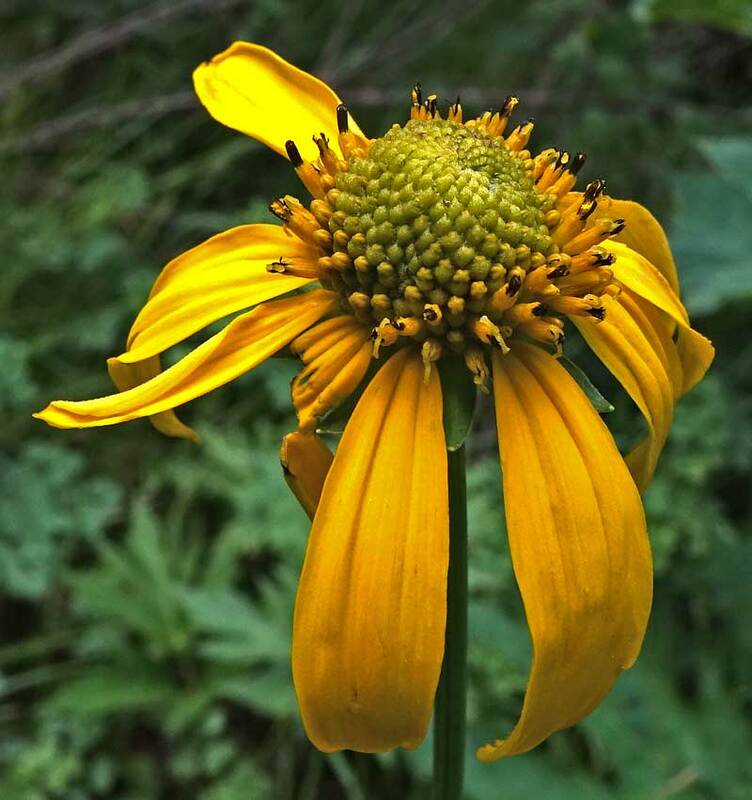 Rudbeckia laciniata is an eye-catching, plant growing to seven feet tall, often in extensive patches in moist meadows and along streams. Its flowers are large and showy, having upward swelling disk and widely spaced, drooping ray flowers. 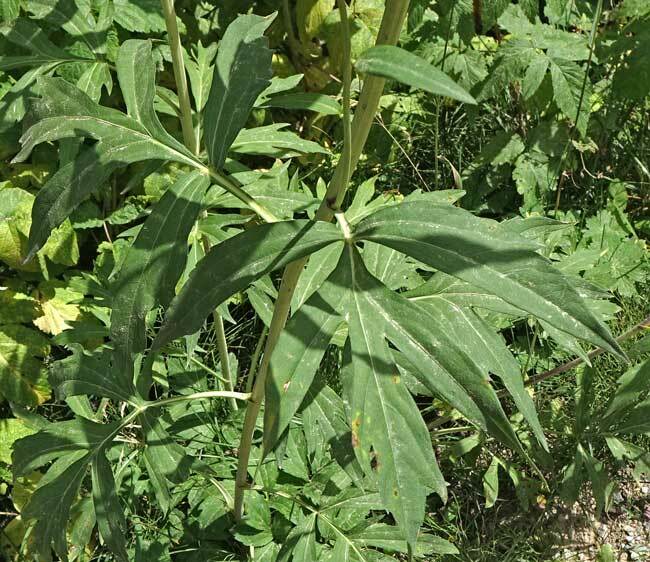 Leaves are large, commonly 4-7 inches, and of several shapes, ranging from simple to compound with margins entire to serrate. Rudbeckia laciniata is one of several Sunflower species sometimes called "Black Eyed Susan" or "Coneflower". 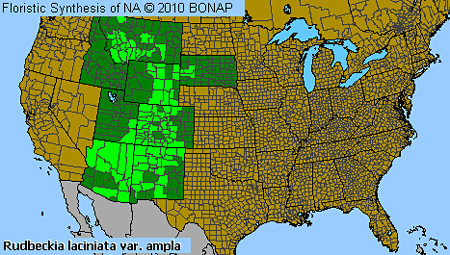 Roaring Fork Road, August 7, 2004; Scotch Creek Road, July 1, 2004; and Little Taylor Creek Trail, July 28, 2005. In the top photograph at left, the central disk flowers are unopened, green, and packed tightly in the youngest flower heads. 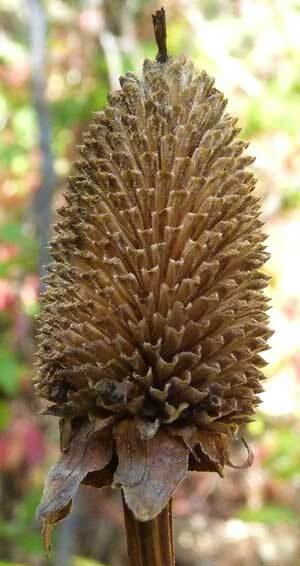 You can also see some disk flowers fully opened (yellow with brown pollen tips) emerging at the bottom of the cones. At the two o'clock position from the center of the photograph, you can see one flower with all of its disk flowers fully opened. The next three photograph at left show Rudbeckia flowers with increasing numbers of open, tiny, tubular, disk flowers. Roaring Fork Road, August 7, 2004 and Taylor Creek Road, August 31, 2017. Three-to-ten inch wide and long leaves are usually deeply and often jaggedly cut into 3 or 5 pinnately to palmately arranged segments. Stem leaves are often petiolate (not petiolate in the top photograph at left but slightly petiolate in the second photograph). In that second photograph you can see that the two leaves at lower center and left side of the photograph are cut into five, a very typical configuration. The two lower leaf segments are cut all the way to the leaf mid-vein but the top three segments are joined at their base. Leaves may be reduced in size upward along the stem. Notice that in the second photograph, the top leaf at the 12 o'clock position is quite small and has no divisions. Basal leaves are usually withered by flowering time. Priest Gulch Trail, September 11, 2017 and Spruce Creek Trail, October 3, 2010. In the top photograph at left, scores of tubular disk flowers remain after ray flower petals have withered and most have fallen away. 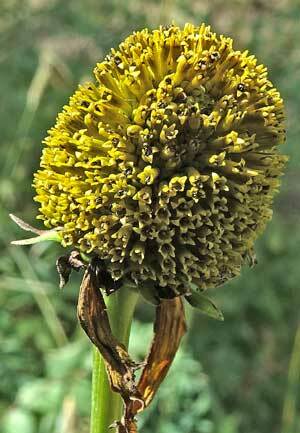 In the second photograph, an empty seed head remains, long after disk and ray flowers have matured and fallen.